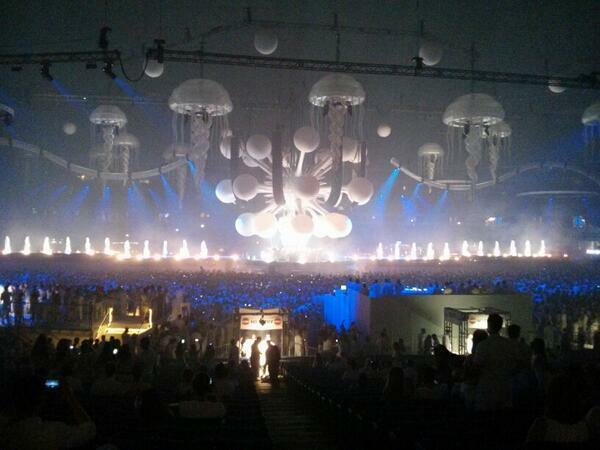 Here’s a few photos from the tweets of last night’s Bud Light Sensation. With over 10 years making it’s waves across the world, Sensation finally arrived on Canadian shores on June 1st, 2013 at the Rogers Centre here in Toronto. I was lucky to snag one of the sold-out deluxe tickets but it was more fun just being on the floor with friends. It was visually spectacular with giant jellyfish hanging from the ceiling, incredible laser displays using water, jellyfish dancers and fireworks. There’s lots of talk about next year’s Sensation in Toronto and there’s clearly a demand for it! Hopefully partnering with another sponsor so that we get better beer. The DJ Lineup included Sensation’s own Mr. White, followed by 2000 and one, Sunnery James & Ryan Marciano, Fedde le Grand, Eric Prydz and Otto Knows. The Rogers Centre was packed up until closing at 3am.